banned in Europe, India & Israel. On 11th March 2013, history was made when the sale of cosmetics products tested on animals was prohibited across the European Union (EU). The testing of cosmetics on animals has been banned in the EU since 2009 but manufacturers could still test their cosmetics abroad and import into the EU where they were sold to unwitting consumers. This confusing situation is now a thing of the past. Although some products sold in the EU may have been tested on animals prior to 11th March 2013, no products animal tested after this date can be marketed. 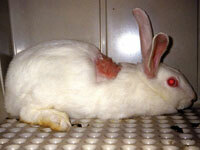 Click here to donate now and help us end the use of animals in cosmetics testing. The ban marks the conclusion of an historic campaign which has seen an end to the use of thousands of animals in cosmetic testing across Europe. The NAVS has campaigned on this issue for over three decades, during which we obtained photographic evidence of the horrors of cosmetic testing, promoted the introduction of alternative methods for cosmetic safety testing and lobbied in both the European and UK Parliaments. In other parts of the world – including China and the US – animals continue to be used in cosmetics testing. This means that some multinational companies can be selling non-animal tested products in Europe, whilst at the same time, their branches in countries where animal testing is the norm, are selling animal tested products outside of the EU. It is hoped that the pressure of the huge European market will encourage these companies to change their testing methods worldwide. Further good news from India and Israel is that both countries have banned cosmetic testing on animals. In Israel a prohibition came into effect on 1st January 2013, after regulations were passed and following a 2007 ban on domestic animal cosmetics tests. In India in June, the Bureau of Indian Standards approved the removal of any mention of animal tests from the country’s cosmetics standard. Change is happening worldwide and we hope that countries such as the United States will follow and animals will continued to be saved from pointless cosmetics tests. Click here to find out more about our cosmetics testing campaign.